How long can nominal house prices fall? The chances of a nominal fall in house prices over the next five years are, I think, de minimis. Remember, this is Southern California, not bubblicious Japan. Indeed, compared to what’s happened to prices over the past few years, the run-up in prices from 1986 to 1990 seems positively modest. 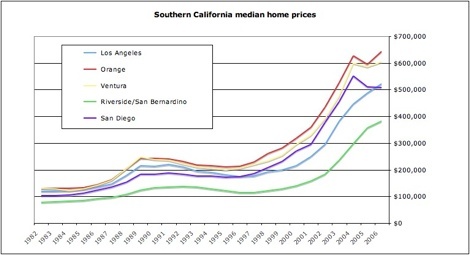 And yet, between 1991 and 1996, the median home price in Los Angeles fell by 21% — and that’s in nominal terms. In real terms, of course, the drop was even greater. Now, one thing I really hate is people who look at charts and reckon they can work out what prices will do in the future based on what they have done in the past. 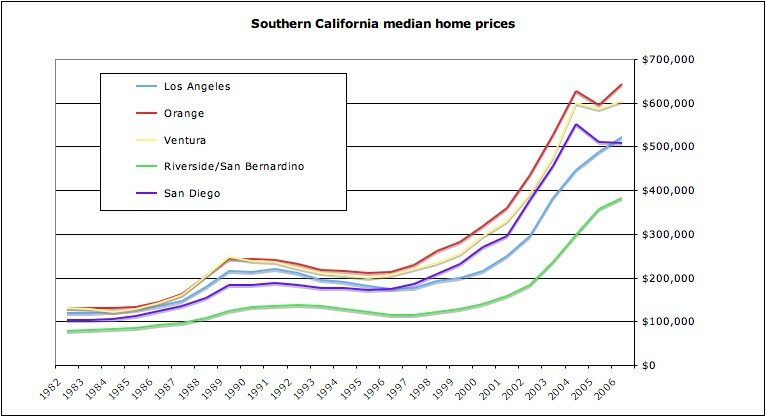 They can’t — and the chart above really tells us nothing about where house prices in Southern California or anywhere else are going. On the other hand, it does show, quite clearly, that house prices can fall quite a lot in nominal terms over a period of many years. If it’s happened before, it can happen again. 3 Responses to How long can nominal house prices fall? Now if you had said the probability of a housing recession lasting that long was de minimus, I would agree. Only between 92-94 did that occur, and the rest of the time prices fell even as the economy fell or rose as employment fell and rose very slowly afterwards. Real prices fell about an equal amount.